A round a table , conversation and debate about been alien on all sort of angles and experiences. Kiki Mazzucchelli is an independent curator and writer working between London and São Paulo. In 2009, she curated Jonathas de Andrade’s solo exhibition Tropical Hangover (Galeria Marcantonio Vilaça, Recife) and an exhibition-in-print project for the magazine Carnation (São Paulo). In the same year she was awarded a two-month International Curator residency from the Fundación Gilberto Alzate Avendaño (Bogotá, Colombia). Recent curatorial projects include the group show Looks Conceptual or How I Mistook a Carl Andre for a Pile of Bricks (Galeria Vermelho, São Paulo), Brazilian photographer Barbara Wagner’s solo show Brasília Teimosa (ICA, London) and the sound-based exhibition OIDARADIO (Paço das Artes, São Paulo). Her writings feature in several publications such as Bravo!, Cultura & Pensamento, ArtPress, Flash Art and others, as well as in various exhibition catalogues. This year’s Fine Art Area Key Ideas series kicked off on Thursday 28 October with a debate and discussion centring around the theme of ‘Brit Art and You’. John Russell – artist and writer. 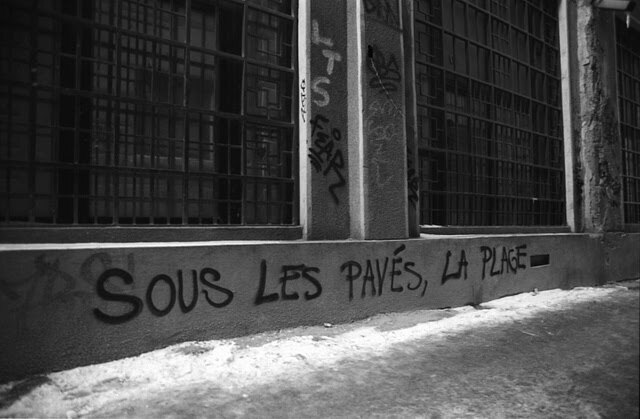 He was a founding member of the BANK artists’ collective. Russell is represented by MOT International. Russell’s Frozen Tears (I-III) anthologies can be viewed at – www.frozentears.co.uk, many of the texts included can be read online. Russell was a contributor to Tate’s Great British Art Debate publication. Cedar Lewisohn - artist, writer, curator and programmer for Tate Media. Lewisohn recently co-curated the Rude Britannia exhibition at Tate Britain. He is currently working on Tate’s Great British Art Debate project – a nation-wide initiative to promote public engagement with art. Discussion Agenda: The Great British Art Debate poses these questions: Is British Art a British fantasy? Should art be good for you? Is art too popular? Does the art of the past say anything about the world of today? Should the public have a say in what goes into museums? Lewisohn and Russell engaged in a debate with the students about these topics and offered a series of provocative ideas for young artists to approach their practice and critical context. Image: John Russell, ‘Untitled’, 2009. There are many wonderful moments and observations in All Souls, Javier Marias’ book about lost souls of all types, but I’ll start with this one. The narrator, a Spanish scholar teaching at Oxford, has been shopping the used bookstores and has just picked up a book signed and annotated by a long-dead author whose works he collects. Yes, it’s probably true that I tend to fall for references to vertigo, but my point here is the recurring fascination with the past in Marias’ books. The lonely and homesick narrator, having a mostly desultory affair with a colleague’s wife, and generally disenchanted with the professorial routine in Oxford, has far more fruitful relationships with the dead – and with their books – than with the living. He comes to life only during the book collecting and research that serve as acts of resuscitation for eccentrics of the past with whom he has become fascinated. The remainder of the time he observes the dead souls and the living dead that surround him, worried that he, too, will become one of them before long. All Souls is haunted by the uneasy relationship between Time and the Self. The person recounting here and how what he saw and what happened to him then is not the same person who saw those things and to whom those things happened; neither is he a prolongation of that person, his shadow, his heir, or his usurper. So who is “he,” then? I’m not sure the narrator ever settles this. Here is another example. Will, the elderly porter at the building where the narrator lodges, exists in a kind of Alzheimer’s time machine. Unknowingly, he lives every day as if it were a different year from the past. Will literally did not know what day it was and spent each morning in a different year, traveling backwards and forwards in time according to his desires or, more likely, quite independently of any conscious desire on his part. No one could predict which date he would choose, far less why he chose it. It was not just that on certain days he believed it was 1947, for him it really was 1947 or 1914 or 1935 or 1960 or 1926 or any other year of his extremely long life. …That particular morning it was 1962 and so he addressed me as Mr. Trevor. Had will found himself in the 1930s that morning, I would have been Dr. Nott… Each day I was a different faculty member from the past, although always the same faculty member from any one particular period… And he never got it wrong. Which brings me the to pair of photographs that show up in All Souls. 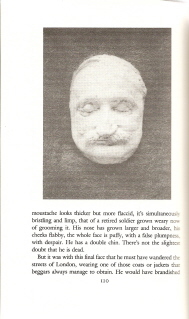 On successive pages a little more than halfway through the novel, we are presented with a photograph of the author John Gawsworth (whose signed book provoked the moment of collector’s vertigo quoted above), followed by a photograph of Gawsworth’s death mask. Even though they are right there on the pages in front of us, Marias spends a page and a half carefully describing the two photographs. Curiously, as I wrote in May, Marias uses photography in a similar vein in Your Face Tomorrow: Fever and Spear. 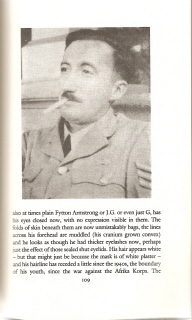 There, the narrator discusses two photographs of his uncle, who was murdered at the time of the Spanish Civil War, before the narrator was even born. The photograph that is reproduced shows the young man, nattily dressed on a bright, sunny day. The other was a post-mortem photograph of the same young man, made for the purposes of identifying bodies and was not reproduced in the book. Whether or not there is a photograph involved, Marias’ narrators often try to read the faces of the people they observe or meet. Marias seems enamored with the now antiquated notion that deep insights or reliable personality traits can be discerned by studying the face, a reminder that Marias, for all his post-modern attributes, is essentially a novelist of the late 19th and early 20th century. There are direct bloodlines from writers like Henry James and Joseph Conrad and Thomas Mann to Javier Marias. Here’s a moment that could have come right out of Death inVenice. In the Ashmolean Museum, the narrator runs across Clare, his lover, who is also visiting the museum and who is accompanied by her son and her father, thus permitting the narrator to study three generations of family faces at once. He follows the trio and observes the faces of Clare and the elderly gentleman before turning his attention to the young grandson. Almost immediately, the three faces are transposed on top of each other as if they were transparent. Here, in contrast to Will, who lives in different years every day, Marias seems to be insisting on the fluidity of personality across three generations. To kiss the lips of his beloved is to kiss the father and the son as well. All Souls, which Conversational Reading calls “something of a precursor” to Marias’ recent three-volume novel Your Face Tomorrow, is less ambitious, more traditional, but I think it might be more successful. It has a companion novel, which I have not yet read, called Dark Back of Time. For some fine writing about Marias, slide on over to Conversational Reading.